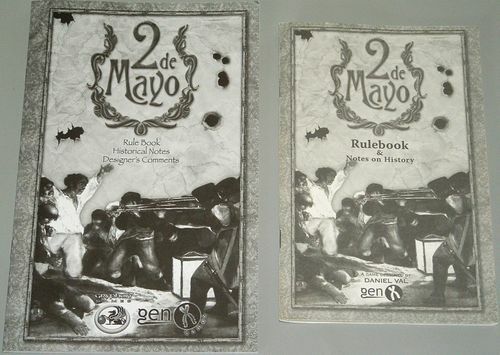 Originally published by Gen-X Games, Spanish designer Daniel Val's 2 de Mayo first made an appearance in 2008. To some extent it defies categorization: is it a war game? 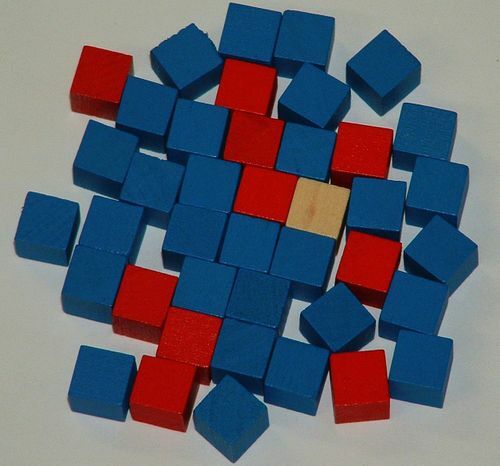 Is it an abstract game? 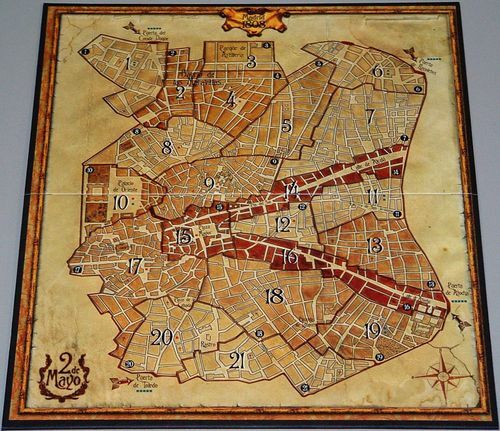 Perhaps it can best be described as a clever asymmetrical cat-and-mouse game for two players, that is soaked with historical theme, full of tension, has simple rules, lovely artwork, and plays quickly (under 30 minutes). When the game was first released, I posted a very enthusiastic pictorial review, and my enthusiasm hasn't waned since. 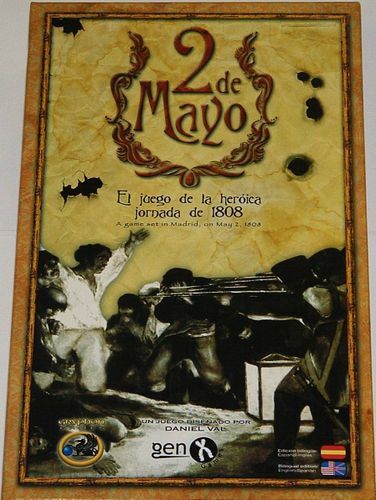 And I wasn't the only one - 2 de Mayo was good enough to win Daniel Val the 2008 Jugamos Tod@s Prize for Spanish Designer of the Year, and in 2009 it was a nominee for the International Gamers Award in the two-player category. In my opinion, 2 de Mayo is even better than the eventual winner (Day & Night)! 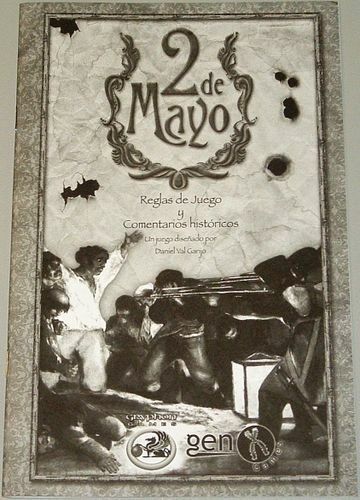 2 de Mayo's popularity hasn't diminished, and at the end of 2009 Gryphon Games published a new edition of the game. 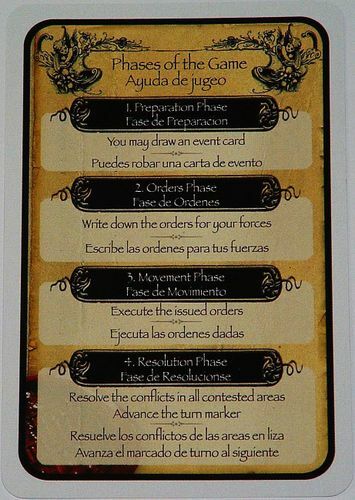 The original game featured Spanish titles on all the cards, and although the game is still bi-lingual (English-Spanish), the new edition gives English more prominence, and also improves numerous other components. I won't be covering the rules or gameplay of the game (for that consult my previous review), since the new edition changes none of that. This is intended primarily as guide to the new edition, for people wondering what comes with the Gryphon Games edition of 2 de Mayo, and how it compares to the previous edition. Some of the components are different size and quality than the first edition. 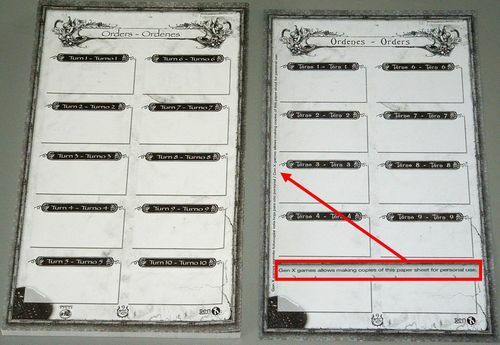 But the actual amount of components is basically unchanged, except for one thing: now there's an entire pad of "orders" sheets, instead of just a single sheet. 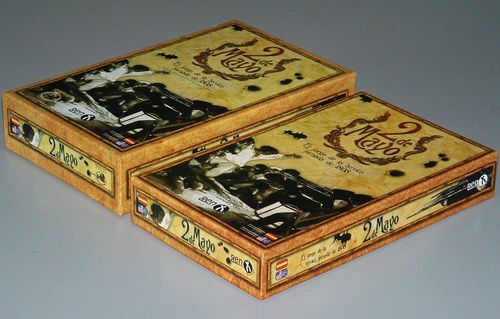 The box is a sturdy one, and features the same artwork as the original, but now with the Gryphon Games logo and a few other minor cosmetic changes. 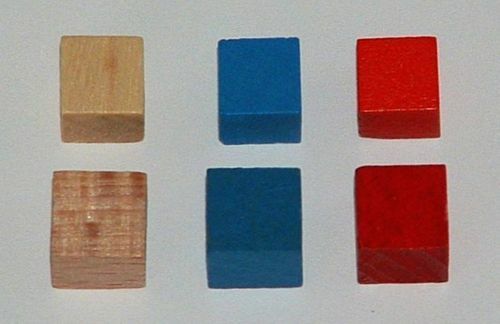 The new edition (pictured on left) has the same dimensions horizontally and vertically, but it is deeper. It also has a nicer linen finish. The previous edition didn't have any kind of insert, but the new edition now has a nice plastic insert, and can house all the cubes with the cards on top. 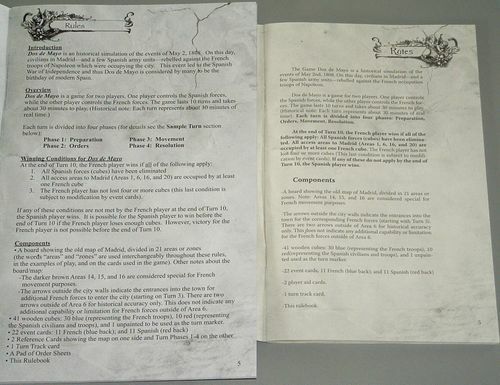 The old edition (pictured on right) just had a single rulebook, with English on one side, and Spanish on the other side. It was also smaller. The text and formatting has also been modified and improved slightly, as the comparison below indicates (new on the left, old on the right). Most of these changes are merely cosmetic and smooth the wording and formatting, since there are no changes to the actual rules. 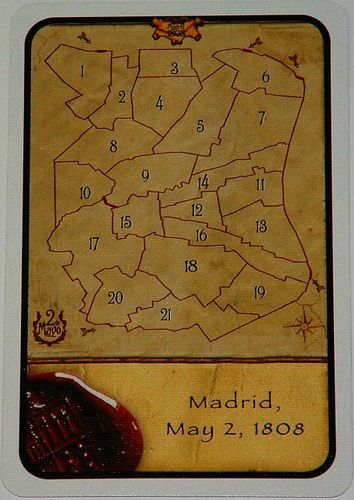 There is one small addition, however: half a page with clarification on certain French and Spanish cards - but you can find this information readily here on BGG as well. The rules also now make explicit reference to a BGG thread about the game - it's always gratifying to see boardgamegeek.com being referenced in a rule book! 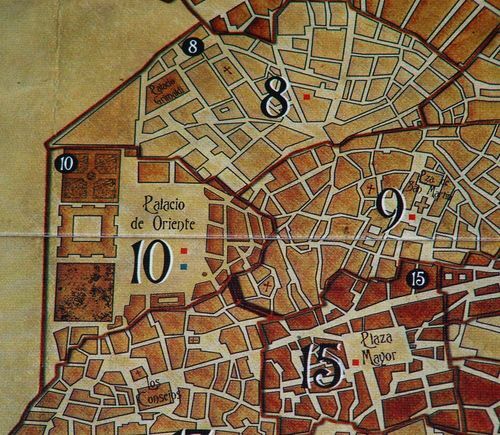 At first glance, the map of the new edition looks unchanged. Certainly the basic artwork is essentially the same. 1. The new edition has a quality linen finish. The previous edition could reflect glare, depending on your lighting, but this is no longer an issue with the new edition. 2. The new edition has all the starting units marked with red and blue squares. 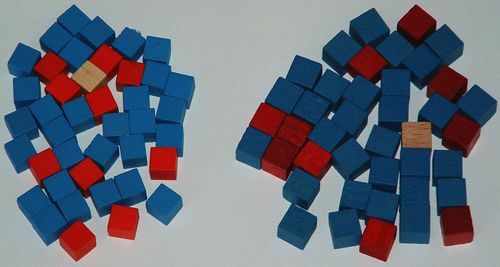 The 30 blue cubes represent French troops and 10 red cubes represent the Spanish. The cubes of the new edition (left) are slightly smaller in size. The French cards are blue-backed, and the Spanish cards are red-backed. The main difference here has to do with the size and quality of the cards. The new edition (left) has much larger cards, and a sturdy linen finish. The cards of the new edition also have a white border instead of a black border. I actually prefer the black border of the cards of the previous edition, but realize that this colour can wear more easily, so as far as quality is concerned the new edition is a solid improvement. Perhaps the most important change with the Event Cards is that the English language has a greater prominence with the new edition. 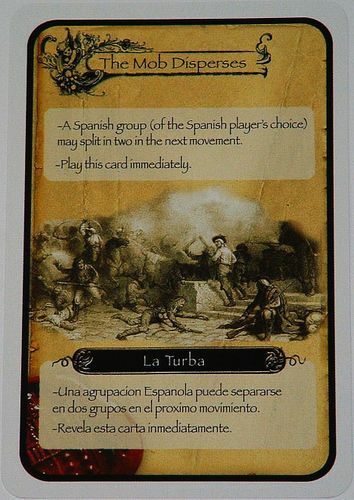 Previously the name of the card was in Spanish, and the Spanish language text was more prominent than the English language text. This has now changed, and the cards now have English names. The English explanatory text is now also more clearly distinguished at the top of the card. For English speaking gamers, this is a welcome change that will help make the game easier to understand and play. The previous edition is quite functional, mind you, but I particularly like having the names of the cards in English. As with the other cards, the new turn track is now a larger card. 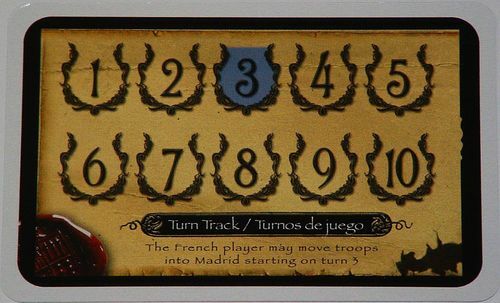 Another improvement is that there's a reminder colour (blue) and note that the French player can only move troops into Madrid starting on turn 3. 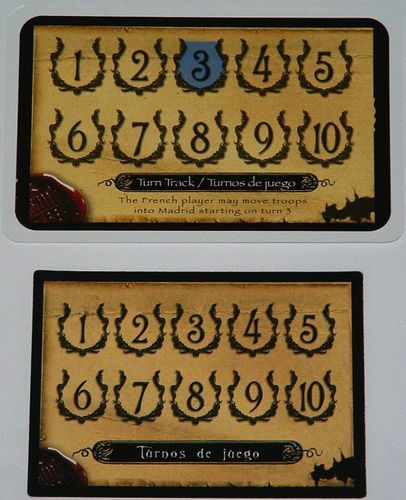 No real changes have been made here, except that the cards are now a larger size (left), and that the English language has a greater prominence rather than the Spanish language text. 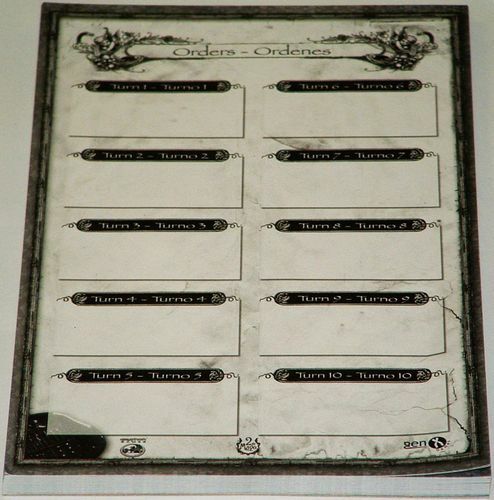 The new edition includes a pad of Orders sheets. It's a thick pad, with many pages. The previous edition (right) just had a single sheet for marking Orders, that gave explicit permission for making copies (inset). 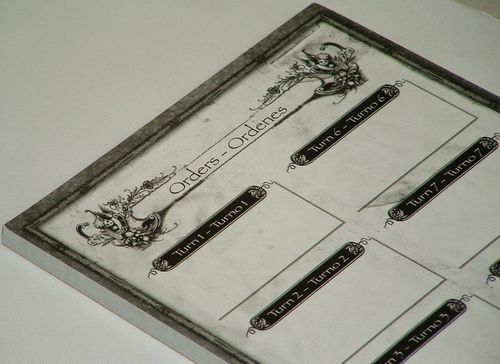 Having a pad of Orders sheets provided with the game is a sensible improvement. 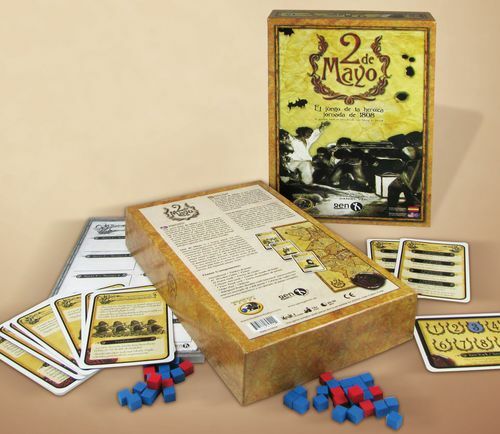 With the new edition from Gryphon Games, the game of 2 de Mayo has not really changed. If you have the first edition of the game, there's no real reason to rush out and replace it with the new edition. On the other hand, gamers who enjoy 2 de Mayo will be pleased with the improved components of the new edition, since virtually all the changes are upgrades. You get a rulebook that has benefited from cosmetic editing, and better quality components all round (better cubes, better cards, better map with set-up units marked, and an pad or orders sheets). Particularly the English titles and more prominent English text on the Event cards is a great improvement (although I do miss the black borders!). 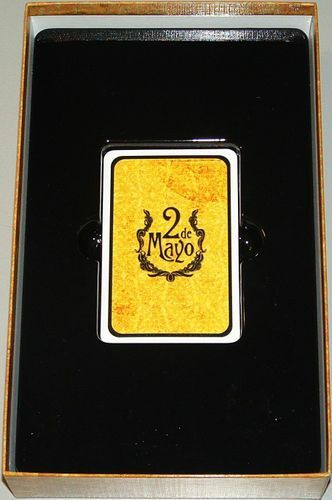 The differences aren't substantial enough to warrant replacing your old copy of the game, but if you don't yet own 2 de Mayo and have been thinking about getting it, the new Gryphon Games edition is only going to enhance the case for buying this great little two-player game. Kudos to Gryphon Games for producing this great new edition, and here's hoping it will help more people get to enjoy Daniel Val's little gem! The 2nd edition makes it all that much better. The new rulebook looks awkward. This looks like somebody quickly hacked it in MS Word with no sense for typography. The old rulebook looks much better. Anyway, this is a great game and I am still happy to see a reprint. The rules also now make explicit reference to a BGG thread about the game - it's always gratifying to see boardgamegeek.com being referenced in a rule book! What a great shout-out, Mr. Ender Wiggins! And a fitting tribute to your amazing work. I already saw the images of this game come up in my subscriptions: was a nice way to announce another great Ender's Game review. You might want to grab my Color orders on one sheet file, I liked having the pages in color. I laminated them and use wet erase markers so they are not consumable. Very nicely balanced. Always more to learn. In the images it seems like they've concentrated so much on enhancing the english, they haven't worried about the spanish at all. 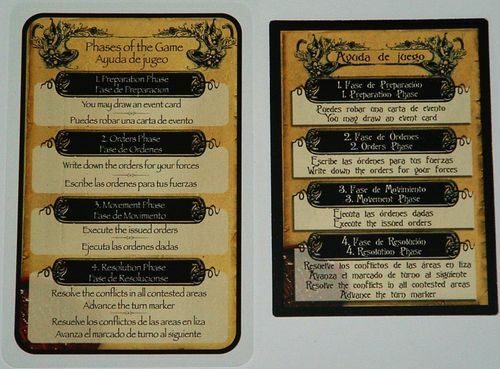 Accents are completely missing and even in the title of the reference cards, "juego" is misspelled for "jugeo". 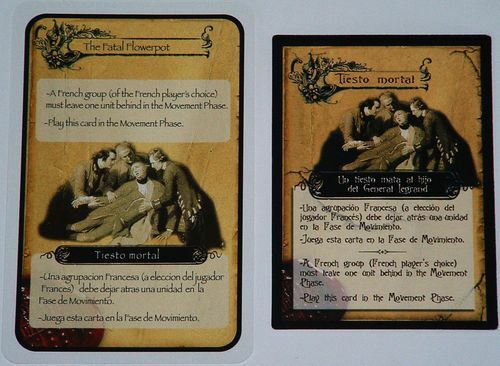 Also, to me it's a pity that in the card example you show, the fact of who was killed by a flower pot is lost in the new edition. It's a shame, but this is really making me think it twice before buying this new edition and giving the game a try.